Home Recipes Jam Up and Jelly Tight: Apple Jelly Is Out of Sight! Jam Up and Jelly Tight: Apple Jelly Is Out of Sight! Homemade apple jelly with chopped cranberries for one-two flavor punch. It’s that time of year when I instinctively begin to ration my homemade preserves. It truly is summer captured in a jar. In the photo, I’m holding one of my favorite concoctions: apply jelly infused with rosemary and punctuated with dried cranberries. Apple jelly is one of my unsung larder heroes, a jellied jewel of rich flavor. To me store-bought apple jelly is a diluted impostor, a bottled blob of sugary pectin with little flavor to speak of. As a result, there is a true bias in the jam world. 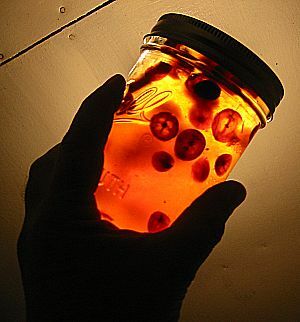 When I leave a jar of raspberry jam with a friend, eyes lights up. Should I share some peach preserves, the cooing ensues. But when I hand over my apple jelly, the reaction is similar to that of being offered a wrapped mackerel. Of course, that reaction is fleeting and rarely repeated if recipients actually open the jar and taste it. A healthy dollop on a warm biscuit has erased many a misconception on the worthiness of apple jelly. Have you ever experimented with spicier jams and jellies… perhaps a spicy chutney? I’m partial to the sweet and hot – like a plum jalapeno perhaps. Just wondering – and – love that blog! Just found your site and looking forward to ripe peaches. Would you share your apple jelly recipe? Cool pic. How does one make apple jelly. Had it first time ever this year while ice fishing in Minnesota. It was heavenly : ). Hi Hafiz, Here’s how to make it — and it’s so worth it. Question: Does jellies take a few days to set up? And if not, what would cause it to be so liquid? I’m a sea level so it’s pretty easy for me to adhere to the 220 F rule. After years of living in Seattle, I moved to the country, and settled into a sweet old Vashon Island farmhouse on four acres of possibilities. I’m a Bulldog buff, writer, grower of fruit, maker of pies, kitchen alchemist, and seasoned hammock tester. Tallcloverfarm.com is where I write all about it.